Above: Sake containers at the Meiji Shrine in Tokyo, Kimono shopping in Harajuku, a canal in Kyoto, Fushimi Inari Shrine in Kyoto. 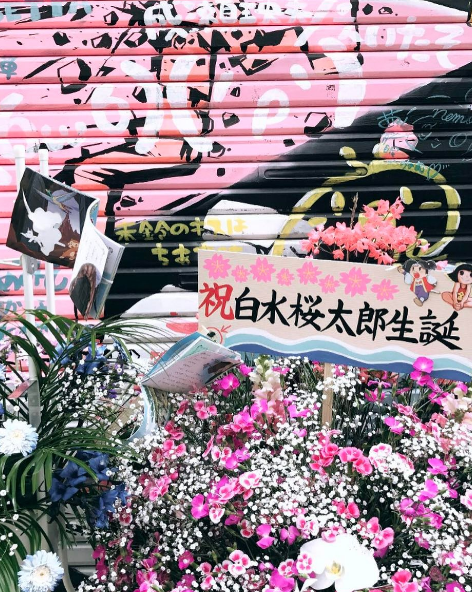 Our favorite spots from our recent trip to Tokyo & Kyoto, Japan! I recommend bringing an extra empty suitcase, as the shopping is plentiful. Enseigne d'angle - Coffee shop: Old school. This coffee shop is right off the busy Harajuku shopping area. You feel like you have stepped into a quiet Cafe in the french countryside. The coffee is not cheap (around $8) but it is the best coffee I’ve ever had in my life. Try a Cafe de l’Ambre or a Cafe Crème. Equally exquisite. TanTan - Vegetarian ramen: The BEST vegetarian ramen EVER! This place is located inside Tokyo Station and you need to buy a ticket to get in to find the restaurant. Once you do make sure to try the black sesame ramen and the golden sesame ramen. Mitsukoshi Ginza Department Store: Gorgeous hall in the basement of a department store. Food is all to-go so plan on bringing it back to your hotel for lunch or dinner and definitely dessert! Make sure to check out Dominique Ansel’s bakery there. It’s super creative and fun. Bar Ben Fiddich - Shinjuku: Cozy bar on a floor of a nondescript office building. Incredible cocktails. Just tell the bartender what you like in a drink and he will make you something special. Always opt to sit at the bar in a Japanese bar, so you can watch the bartenders do their magic. JBS Records Bar: Jazz, Blues and Soul. This bar, also on a floor of a nondescript office building, is a wood paneled space is lined with walls of records, and the owner carefully decides what record to play and puts it on display. Cheap no frills drinks and great music. Convenience Stores: Lawson, 7-11 and Family Mart are everywhere. Always pop in and buy a couple snacks. Each store has a different selection and it’s super fun! Kiddy Land: Very fun shop full of Japanese kids toys! Tokyu Hands: Multi level ‘hardware shop” full of everything you could ever imagine. Home goods, stationary, etc. Chicago Vintage- multiple locations: Vintage Clothes. Great selection and prices. 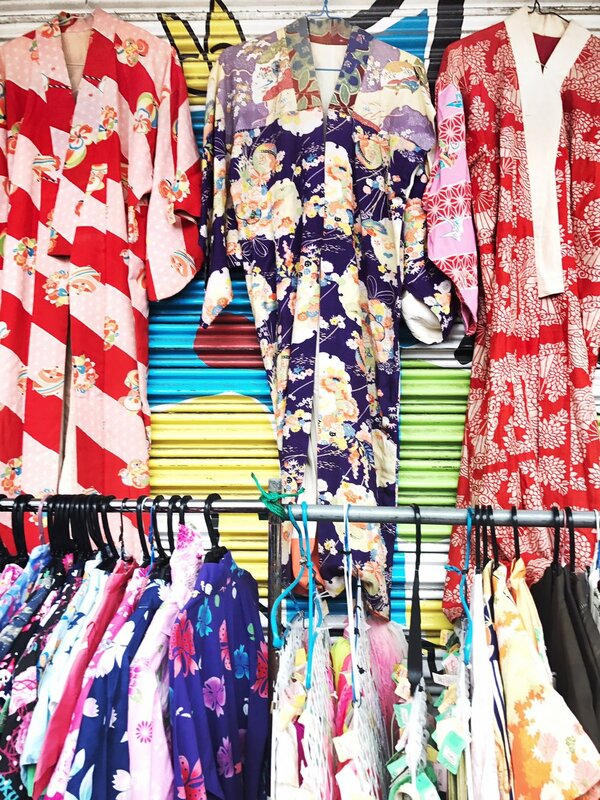 Take home a Yukata (a Japanese summer Kimono) or two. Mori Art Museum: Beautiful modern art museum with great views. National Art Center: Epic modern art museum with a focus on Japanese contemporary art. Yoyogi Park and Meiji Jingu Shrine: Stroll through this park and stop by the Meiji Jingu shrine (free). Note the wall of giant sake bottles which are offerings to the gods. Imperial Palace gardens: Make sure to stop by these gardens on a nice day and enjoy the wonderfully manicured grounds. Above: A flea market find in Tokyo, a street scene in the Taito neighborhood of Tokyo, the climb to the summit at Fushimi Inari Shrine in Kyoto, Cherry Blossoms in Maruyama Park, Kyoto. 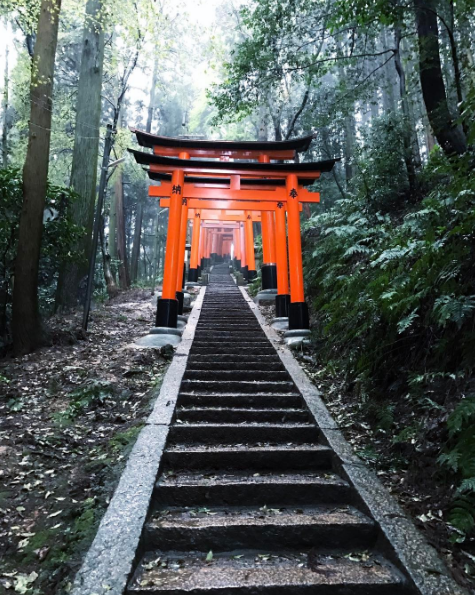 Fushimi Inari Shrine: (pictured above with the orange gates) this shrine was the most beautiful one we visited. If you're feeling adventurous take a hike up the mountain through the forest to the summit. Maruyama Park: Lovely and central park in central Kyoto to see some cherry blossoms. Finlandia Bar: A beautifully designed bar in the historic Gion district. Quiet and discreet, this bar provides expert cocktails. Star Bar: Another favorite. This was where we first realized Japanese cocktails are something to consume as frequently as possible Unpretentious and perfect.